I am participating in a ” 31 Days of…” series for the month of October. You see a whole bunch of sweet blogger buddies have been getting together the past few years to do 31 posts about a topic that they have a passion for. This year they have invited all of their readers to post 31 days of their passions. The blogger that first introduced me to this series was The Nester, if you are interested in participating in the 31 Days of…series, please visit her site for more information. I hope you enjoy my series on finding treasures both vintage and of the heart. Let’s hope I can overcome my inconsistent blogging habit and share those 31 posts within the next 31 days! Wanna go to the show? The first day of 31 days, doesn’t it feel like the first day of school? Except there aren’t any new teachers to meet, or awkward seating assignments there’s only the fear of writing 31 posts in 31 days! Although, I’m up for the challenge, especially considering I’ve decided to share 31 days of treasure hunting. No, I’m not talking about buried treasure on some deserted island, this treasure could be vintage treasures found at your local Goodwill or found-already-owned-items that can be re-purposed, or even heart treasures that the Lord has sweetly whispered. The topic of treasures could be too broad for this series, but let’s see where it takes us shall we? Can you spot it? 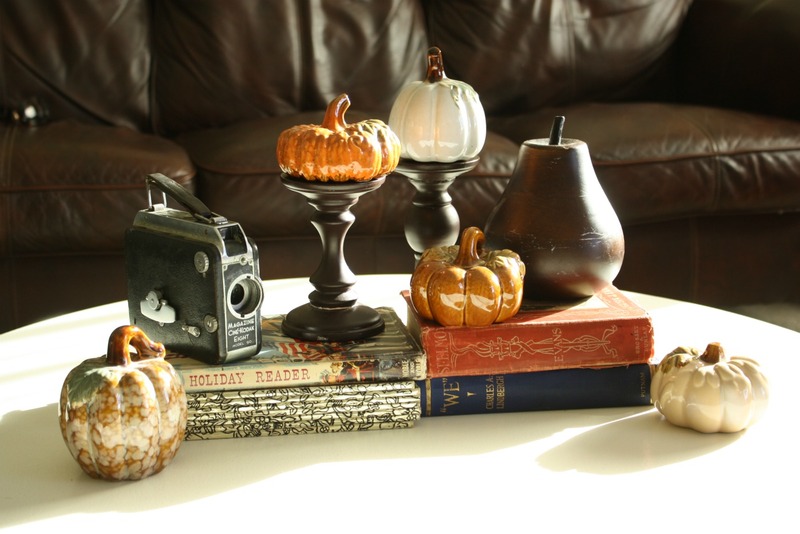 Yeah, there’s some old books there that I plan on sharing with you later on, and there’s some ceramic pumpkins from last year, but I wouldn’t call them vintage especially since they came from the dollar store. Give up? Well, O.K. You see that small camera there, on top of the stack of books between the pumpkins? 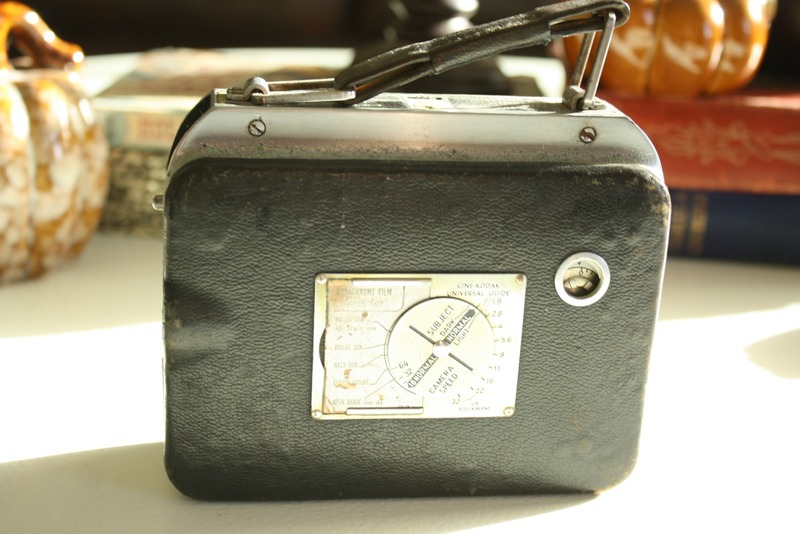 Yep, that’s our first treasure, a 1930’s Kodak movie camera. I bought it at a local thrift store for $1.34 a couple weeks ago. And it still works! At least, something happens when it’s wound up and cranked! It’s missing a lens, and I really don’t know if film can be found for it anymore. But doesn’t it look cool sitting atop my coffee table accessorizing those books? You really can’t see it in the pictures above, but there are settings for different weather conditions like, bright sun on light sand or snow, plain bright sun, hazy sun, open shade in clear sky, and cloudy bright. Pretty high tech for back in the day if you ask me. 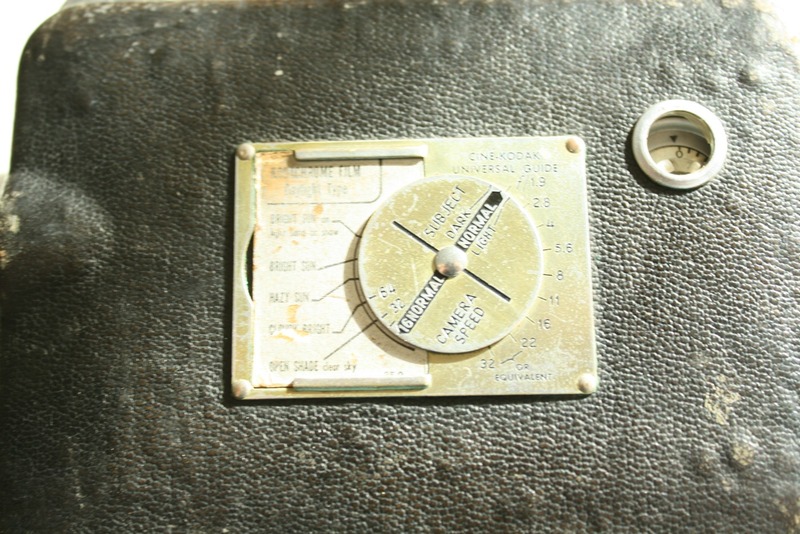 The whole camera is made of metal and covered in leather, it’s a Kodak and dated 1937-1938. It’s beautifully old and one of my favorite pieces. And all for less than $2! That certainly makes for a treasure in my book. What have you recently found that made your heart go pitter-patter?